home to roost, originally uploaded by j.twinn. I really love painting dressers and could not resist painting another one using different colours. 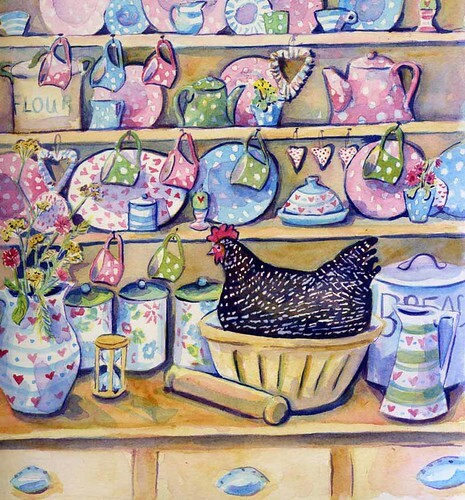 I have been trying to give myself a crash course in different chickens as I always paint the same types. I think she looks very compfy in her little nest. I imagine she is keeping an eye out for any crumbs that come her way. The hedgerows are full of wonderful berries and the leaves on the trees are slowly turning there lovely golden shades. I went out hunting for rose hips being sure to leave some for the birds, to make these little hearts with. 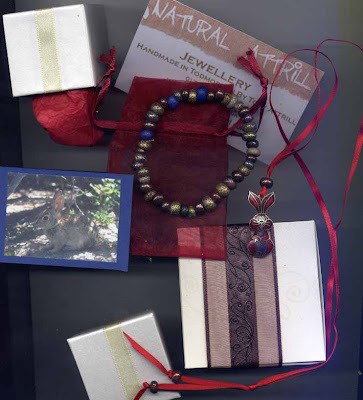 I received a wonderful little parcel full of lovely things from Toby and Penny from their blog, natrill atrill. I was lucky enough to receive this because of celebrating the 200th post,which is amazing. I really liked the little card with a picture of a rabbit on and the rabbit bookmark all wrapped up in a little box. I have been wearing the bracelet all the time. Its made by Toby Atrill who must spend ages making all the beads which are full of glitter. I'm a big fan of glitter. Thank you very much.